I’ve been trying to destash my fabric stash for like a year now. It’s not working. I decided to tackle it by making a few skirts for me with my bigger pieces of fabric. This is the easiest skirt tutorial ever! I just made it up as I went, but as you’ll see it’s very basic! Like the most basic. It is the perfect starting place if you’re interested in making your own clothes. We’re going to gather at a 1.5 to 1 ratio. So, measure your hips and multiply by 1.5. That’s how wide your fabric should be. If you’ll be adding pockets, add 1 inch and cut your length in half. Measure from your hip to your knee and add 3 inches for the length. If you want your skirt to sit at the waist, use that measurement instead. You can also adjust the length however you want. One pocket completed (in the middle) and one side seam finished. You’ll have one piece of fabric to work with, just as if you were making it without pockets and only one seam. The other pocket will be split in two on both sides of your length. 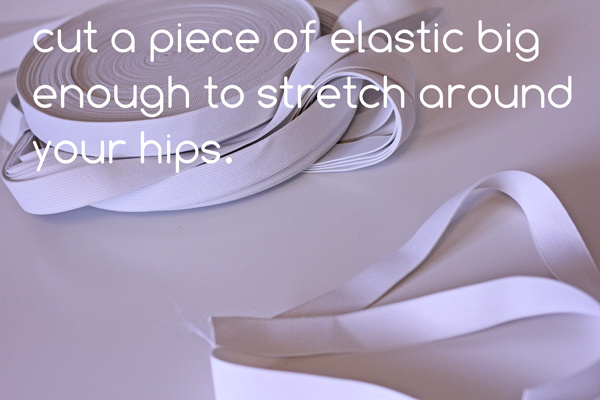 To make a place for your elastic to go, serge the top edge of your fabric. If you don’t have a serger, just fold over 1/2″ and press instead. Now, fold over 1.5″ on and press. Pin and sew it up, 1.25 inches away from the top edge to make a casing. 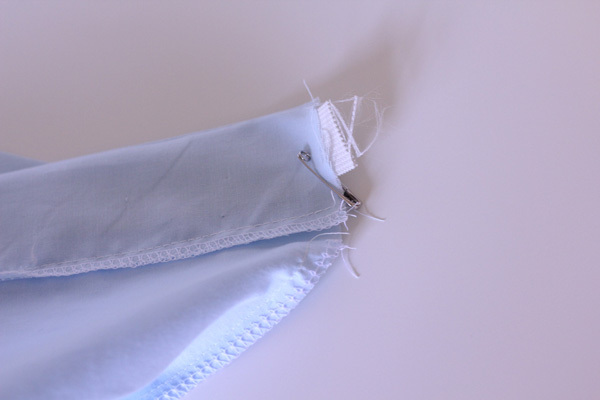 Now use a safety pin on one end of the elastic to help you guide it through the casing. Start threading. The safety pin will be your guide since threading a flat piece of elastic is difficult! When the other end reaches the edge of the casing hole where you started, pin it to the skirt so it doesn’t get pulled in and lost in your casing. Once you get to the other side with the first end, pin it to the edge. Look, your skirt is starting to gather! So pretty! Pin the two sides together with right sides together. Pin the pockets together if you have them and sew it up! Make sure to catch both ends of the elastic in this seam. That is what will keep your skirt up! Finish the seam with a serger or other method. It seems so easy love! You are right we should try it.Thank you for that! How perfect! I love a simple skirt . . . especially one with pockets :-) And the new header is adorable! I love it! Um, that is one amazing roll of elastic you have going there. Wow! Looks great! I keep trying to reduce my fabric inventory… but it just seems to breed when I’m not looking. You make it look so easy! Easiest enough that I might be able to try it. Great tut! Thanks. Thanks for sharing…so easy and cute! Love it. Hi Kate – I visit your blog everyday, and I’m excited to sew my very first skirt using this tutorial. One question. Under step one (Cutting) it states “If you’ll be adding pockets, add 1 inch and cut your length in half,” but won’t that turn my skirt into a mini? I’m a newbie so thanks in advance for your patience. So, if you’re adding pockets, make the piece 1 inch wider. Then cut it in half, so you’ll have two pieces half as wide, but the same length. The 1 extra inch will make up for the extra seam allowance.